Ministries How do I Get Involved? Pastor Larry was born and raised in Southern California. After graduating from Artesia High School, went on to Cerritos College and received an A.A. degree in Administration of Justice. After coming to Christ attended Calvary Chapel Bible College and pursued a Bachelor Degree in Biblical Studies. He has been an Ordained Minister since 1989. While in high school Larry met his wife Patsy (Salcido) at a track meet he was competing in at her school (Gahr). They were married in 1985 and raised four children in the city of Norwalk. Now with their children grown and having children of their own, they are enjoying time with their many grandchildren. After living a life of gang violence and drugs Pastor Larry gave his life to Christ in 1984 and began to pursue a life of ministry. In 1986 he founded New Heart Street Ministry, an outreach ministry to gang members. In 1987 Larry came on staff at Messenger Fellowship as Outreach Pastor and later Associate Pastor under the leadership of Pastor Don Metcalf. Pastor Larry has served in various ministries throughout the years including; Prison Ministry, Street Ministry, High School, Jr. High, Married Couples and Men’s ministry. He has traveled to a number of countries like Mexico, Russia, Japan, Korea, and in the U.S. to participate in short term mission’s trips. Currently he is serving as Associate Pastor at Desert Reign Church where he oversees the various ministries in the area of administration, as well as leading the Men’s Ministry called the Watchmen. Pastor Larry says “I was radically changed by the power of The Holy Spirit at conversion, and I will live the rest of my life preaching and teaching the love of Jesus Christ found in His Word…I’m compelled to.” May the Lord Bless you, success to you and success to the Kingdom. Pastor Alex is one of the nicest, most helpful guys you’ll ever meet. When people say, “Oh, Pastor Alex has been ‘around-the-block'” they are referring to the fact that he has seen a lot of action on the streets and blessings in the church. Pastor Manual and Sara Godinez have been married for 18 years. They have pastored in the city of Los Angeles for 13 years. They have been a great blessing for many families and now God has called them to be part of Desert Reign Church pastoring the Hispanic people of the City of Downey. Come and be blessed by this new ministry !!! 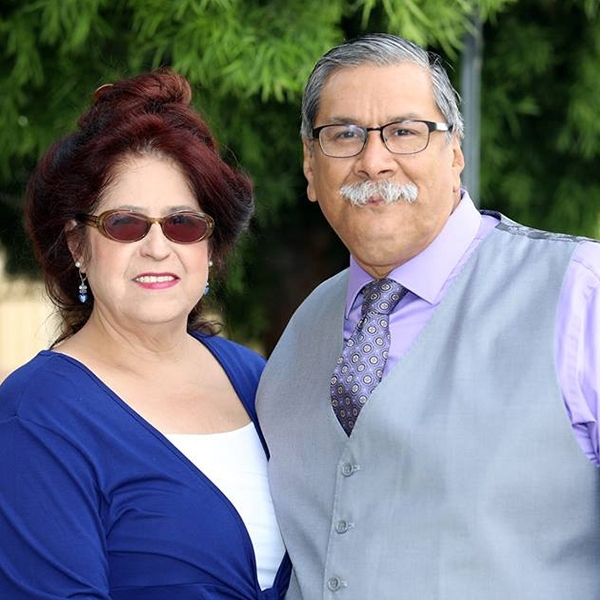 El Pastor Manual y Sara Godinez es un matrimonio de 18 años han pastoreado en la cuidad de Los Angeles durante 13 años siendo de gran bendicion para muchas familias y hoy Dios los ha llamado a ser parte de la Iglesia Desert Reign pastoreando al pueblo hispano de la cuidad de Downey. Ven y se bendecido en esta nueva Promesa de Dios!!! Pastor Dan Dutch was born and raised in southern California in the South Bay area and attended Banning High School in Wilmington. Dan received Christ at a youth rally at Calvary Chapel South Bay in 1980. Dan met his wife Susan in 1985 and they were married in 1987. They have four children all of which grew up in Downey CA and attended and graduated from Warren High School. Pastor Dan's past struggles as a young man with substance abuse and violence have given him a heart to minister to the youth. Pastor Dan started ministering to the youth at Los Padrinos Juvenile Hall in 1991. He became a licensed counselor with LA County Probation and counseled incarcerated youth in the Probation system for the Chaplains Eagles ministry and became a Chaplain in 2017. He has served on the Building Committee and Church Board of directors at Desert Reign Church for several years. Currently, he is serving as Executive Pastor at Desert Reign Church and is currently going through the credentialing process with the Assemblies of God. Pastor Dan says that "If you say yes to the Lord, you'll live the most exciting and fulfilling life possible. I never thought I would be speaking or preaching from the pulpit, but when the Lord calls you, he sees gifts and talents that you don't. He will grow and stretch you for His purpose. We serve an awesome God!" So, say yes to the Lord and see what happens! God bless you. WALK WITH THE LORD. THOSE AREAS ARE WORSHIP, CARE, PRAYER, AND EVANGELISM. Nursery Care is provided in both services. © 2018 Desert Reign Church. All Rights Reserved.